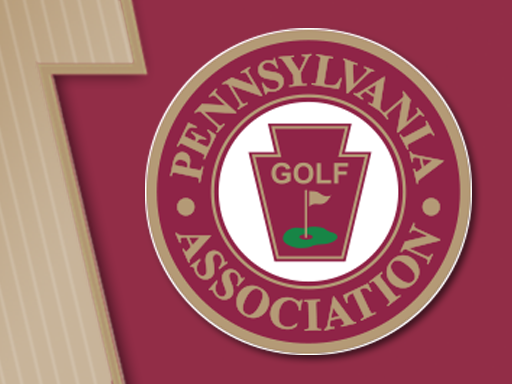 One golf course and three golf clubs have preceded Talamore on this site in Ambler. But what the record must show is that the current eighteen is a brand spanking new course which owes nothing to the past. The history of this property over the last 90 years is a checkered one. In 1904 Henry Scott McLean, descendant of an early Pennsylvania governor and signer of the Declaration of Independence (Thomas McKean) assembled a number of small parcels of land to create a large estate, then commissioned noted Philadelphia architect Horace Trumbauer to design a mansion in the English Gothic style. The estate remained in the McKean family for only about 20 years. Over the next 70 years, beginning in the mid 1920s, it was first, and briefly, the headquarters of a rifle club. Then a golf course called Pine Run was laid out here. The Pine Run Golf Club gave way to the Bankers Country Club in the 1930s. Bankers was succeeded by Oak Terrace. In 1969 the estate, including the course, was acquired by the Archdiocese of Philadelphia. Subsequently, the property passed through a couple of hands, to be bought in early 1993 by Realen Homes. On this 340-acre tract along Route 63 (Welsh Road) Realen is building some 370 dwellings. Robert Levy, Jr., head of Talamore Group, Chestnut Hill, acquired from Realen in 1993 the land needed to build a new golf course, which would be the centerpiece of the residential community. It was Levy who, in 1990, had constructed the highly regarded Talamore eighteen in Pinehurst, North Carolina, to the design of Rees Jones. With this experience. Levy chose to serve as the architect for his course at Ambler. Construction began in 1993 and the full eighteen opened for play on July 1,1995. Levy took great pains to save the many stately trees here. The par-71 layout offers five sets of tees, with overall length ranging from 6,700 to 4,686 yards. The members’ markers provide a test that is 6,430 yards long, that requires a number of forced carries, and that boasts no less than ten water holes, where the shot is threatened by streams or ponds or wetlands. The course, routed over gently rolling ground, gives the player plenty to think about. On a course that does not lack for spine, there are a number of holes that stand out. The opener, for instance, is the #2 stroke hole. It measures 417 yards, it tends smoothly uphill, it gets narrower the farther we go, and it calls for two strong swings. The next hole is a decided change of pace. At 347 yards, it is not brawn that counts. Here there are five small and irregularly shaped ponds to bedevil us, one of them on the right in the tee-shot landing area, two at the green (one squarely in front of it, another across the back and edging down the left side). We find ourselves playing the hole defensively. The 9th, 330 yards, is also notable. The drive must carry a solid 200 yards over rough country to a narrow landing area. The pitch is admittedly short, but the green, small and boldly contoured, comes fully equipped with, on the left, a long snaky bunker and a pond. The home hole is a par 5 of 480 yards, a double dogleg where the big hitter may go for the green in two. It is a seductive prospect. But what gives pause is, as you might expect, another of those pesky ponds, this one on the left to swallow the daring but overcooked draw. A 1996 photo of the entrance to the clubhouse at Talamore. The clubhouse here at Talamore (a Scottish word meaning "land of great value") is a link to the past. 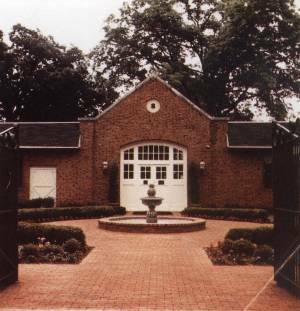 Bob Levy has taken the old brick stables, a characterful and sprawling one-story structure, and sensitively revamped them to accommodate three dining rooms (one with a hospitable old oak bar), plus banquet facilities, in a way that provides contemporary comfort yet still pays obeisance to the estate’s beginnings.